There are many below-grade waterproofing products on the market. Most manufacturers require you to become a certified applicator before they will guarantee an installation. If you're just going to do occasional waterproofing, I suggest you choose one product, get certified by the manufacturer, and learn all about that one product. Eventually you'll get good at applying it and be able to work quickly and safely. Different products can have very different characteristics, so only specialty waterproofing contractors should try working with multiple products. 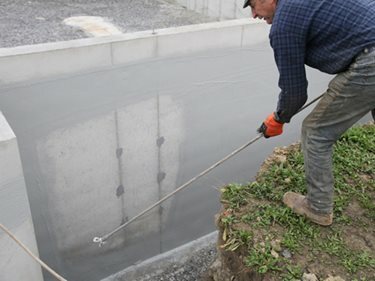 Because there are so many materials on the market, any waterproofing job should begin with a careful review of the manufacturer's literature, maybe a phone call to a technical service representative, and possibly even a site visit by a field representative. Cementitious products are probably the easiest waterproofing materials to use. They're readily available from suppliers of masonry products, and they're easy to mix and apply. If you plan to use this material, a long-handled brush will make your life easier. Also, spend the extra money to buy acrylic additive (a white, milky liquid) to mix in with the cement product. You'll get better bonding and a more solid, durable coating. The chief disadvantage is that cementitious products have no give to them probably because cement just doesn't stretch to any degree worth mentioning. They will stand up fine to a head of water, but will tolerate almost no joint or crack movement. You apply a liquid membrane by spray, roller, or trowel. The liquid cures into a rubbery coating on the wall. One manufacturer has a spray-applied liquid membrane composed of polymer-modified asphalt. Polyurethane liquid membranes in separate grades for trowel, roller, or spray are also available from various manufacturers. Deco Seal - Gray Waterproofing Membrane that can be sprayed or rolled on. Waterproof protection above and below grade. The manufacturer probably has a special procedure for treating voids, form-tie holes, and joints. 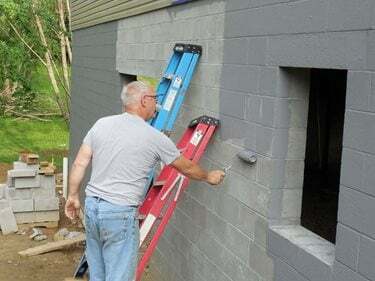 At the wall-footing joint, you may be required to use cement or other trowel-grade material to form a "fillet" (radius or cove) before applying the overall coating. Liquid coatings have the advantages of quick application, low in-place cost, and excellent elongation. One of the chief disadvantages is the possible inconsistency in coverage. The typical application thickness is 60 mils, but it takes a careful applicator to be sure of always achieving that minimum coverage. The most commonly specified sheet materials are self-adhering rubberized asphalt membranes. 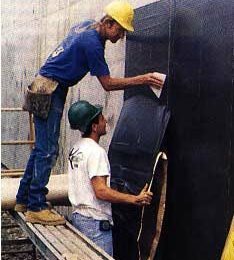 These 60-mil-thick membranes are composed of rubberized asphalt laminated to a waterproof polyethylene film. The asphalt side is incredibly sticky but is covered by a release paper, which you remove during application. The first time you work with this material, it'll drive you crazy because it sticks to everything. But you'll be surprised how fast you can move with it once you develop a rhythm. It takes two people, one on top to smooth it out and stick it down, the other on the bottom to pull off the paper. You'll have many details to learn about surface preparation, priming, patching, joint treatment, terminations, lap joints, penetrations, and corners. Because they're so sticky, these membranes can be pretty unforgiving. Once a piece is down, you won't get it back up again at least not in reusable condition. However, the system allows easy repairs of holes, fishmouths, puckers, and wrinkles. You'll patch holes or damaged areas with a piece of membrane placed right over the first layer. With a fish-mouth or wrinkle, all you do is slit the raised area, press it down flat, and cover it with a patch. A chief advantage of sheet membranes is their consistent thickness. Because they're manufactured to exacting tolerances, you can be sure of the 60-mil coverage. These membranes also have good elongation. A higher in-place cost is one of the main disadvantages of sheets. The cost of the material itself is likely to be greater on a square-foot basis than the liquid membranes. Labor cost is also higher, because of all the cutting, handling, reinforcing, and detailing you have to go through during installation. Not everyone agrees, however, that sheet membranes lessen the quality-control risk. A rubberized liquid forms a continuous, seamless coating, whereas a sheet membrane results in many seams, with the potential for a poor seal. If you're applying these materials, make sure your lap joints are tight and properly detailed. Make correct use of the manufacturers mastic or other accessories. For example, one manufacturer requires you to apply a bead of mastic to every lap joint within 12 inches of a corner when using its product. This is a good system with a lot of strength, but probably not much elongation ability. You can produce a similar built-up waterproofing system using cold, trowel-grade dampproofing and reinforcing fabric. Again, this system has some strength but little elasticity. Sodium bentonite, a clay material, has enjoyed a steady upsurge in popularity over the past several years. In panel form, bentonite has become the choice of a growing number of architects and builders. Bentonite works because it can absorb a tremendous amount of water. As it takes in water, the clay swells to 15 times its original volume and pushes itself into cracks and voids. When it reaches its maximum volume, it stays in these areas permanently to seal against water. One firms panels are 4x4-foot corrugated cardboard with clay particles held within the flutes of the cardboard. The panels can be nailed, fastened with a powder-actuated tool, or simply laid in place for horizontal applications. Some waterproofers are nervous about using bentonite panels. With other products, you can inspect the finished waterproofing application and confirm the integrity of the seal before backfilling. With bentonite panels, the seal doesn't form until the foundation is backfilled and water reaches the panel. Suppose something goes wrong? It's a nagging question for "traditional" waterproofers. Bentonite has its advantages, however: It's safe to work with, non-polluting, easy and quick to apply, and can go on even at low temperatures. One company makes a sheet membrane that uses a compound of bentonite and butyl rubber.